Alex’s birthday is getting closer and closer. No longer is it next month, or next week; it is tomorrow. Birthday lists have been prepared and presented for the last four days, and a picture of a laptop mysteriously appeared on my computer keyboard. Alex has no problem getting her wishes and desires communicated to us; orally and in written format. The only difference between her and her siblings in this regard, is her constant reinforcement to us. I believe she likes to have this control in her life. Her birthday is something she can create that is all hers. We will do whatever she likes, and her needs will not be pushed aside in the management of three children.She is relentless and I love it! This schedule needs a little interpretation. 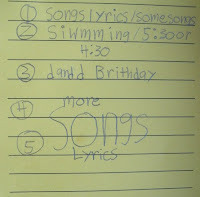 Alex has decided she wants to be a song writer when she grows up. 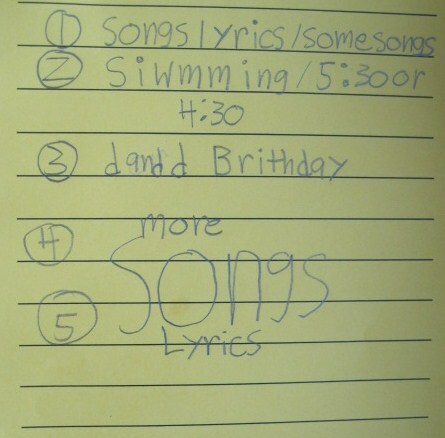 She has been actively searching for song lyrics on the internet, printing them and transcribing to a paper note book. Along with being able to use facebook undisturbed, lyric transcribing is the primary motivation for the laptop. What parent can say no, when their child wants a laptop to further one's future career? Not me.....tomorrow Alex will have her laptop. After working on her songs, I am allowed to take Alex to the pool , where we will hang out until 5:30 or 4:30; lunch included of course. Dinner with Dad is next. Alex has allowed John to get some exercise on her birthday; we all know Dads can be very grumpy if not allowed to exercise on the weekend, but his presence is requested at dinner. Funny, I see no mention of Courtney or Tom in any of our birthday activities. I guess the lesson of inclusion will need to be reinforced. Dinner will be at one of Alex’s favorite restaurants (there are way too many), she will try to order a cheeseburger with fries. I will remind her 17 year old girls need healthy eating habits. I will suggest a low calorie dessert; maybe I will be successful this time. When we return home after dinner Alex will work on her song lyrics some more on her new laptop. The celebration will continue the next day when Alex and the Ninos participate in a local fun run. I have asked the team to stay after they complete the run to have cake and ice cream with Alex. This will be her "party", always an important part of the birthday celebration. Did I mention calories already? Do cake and ice cream qualify? How about the cupcakes Alex had in the beginning of the month at school, for the summer birthday kids? Or the cookies she had at summer school yesterday? I am counting at least four high calorie birthday celebrations…enough!! The sun is going to shine on Alex’s birthday, and our world will be bright and warm. Everyone Alex sees will know it is her birthday, as she will tell them. I will be even more proud of Alex than I already am. Alex is magical and creates happiness in my life every day. It is my celebration too, a celebration of the day our eyes were opened to a beautiful world we never knew about; the world of down syndrome. Happy Birthday to Alex (and you too, a little late!). Did she just love the laptop? Very exciting!